Timber Harvesting’s June issue spotlights Michigan woodsman Bill Beacom who has been an industry professional through and through with his company Beacom Enterprises, Inc,. 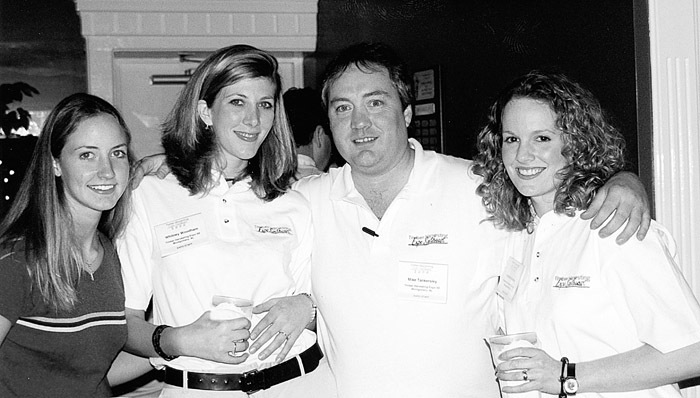 which produces chips for Georgia-Pacific’s Michigan particleboard plant with a Trelan chipper. Wood Tick Trail features an industry notebook. Also, North Carolina Forestry Association is mentioned for taking time to make the woods safer. 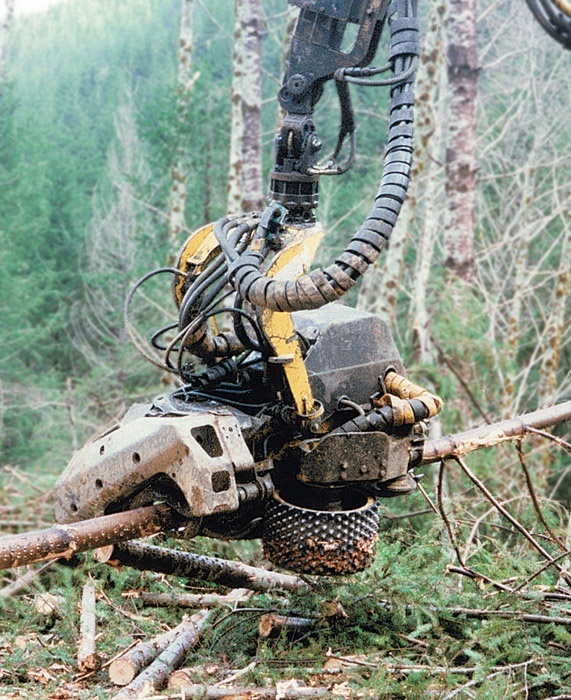 In the last decade, the variety of mechanized felling techniques has expanded, giving loggers more latitude in selecting a system that meets their needs based on terrain, operating costs and mill or landowner demand. 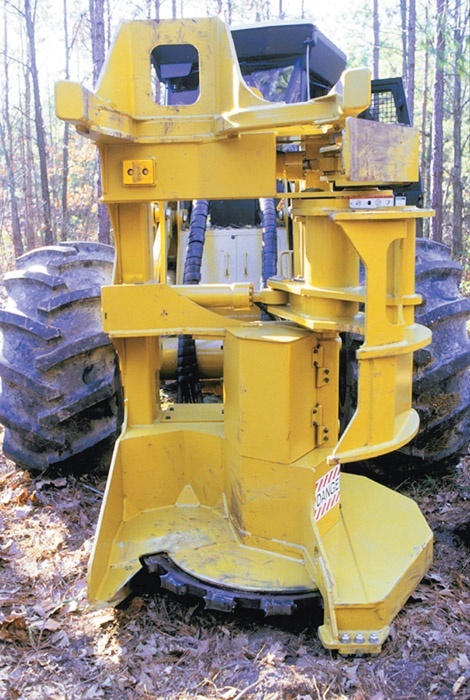 Drive-to-tree felling attachments basically fall into three categories: shears, high-speed disc saws and bar and chain sawheads. The original Skogsjan line has been modified and upgraded to provide a full line of CTL heads for Cat wheel carriers or Cat track carriers. The heads are designed to handle everything from first thinning to final fellings, and offer high production, accurate measuring and ease of maintenance. All four heads use a patented feeding mechanism that keeps the feed rollers centered on the stem as the diameter changes. What’s up with the Southern Logging Coalition? I tried to find out recently upon hearing reports that Southeastern Wood Producers Assn. had decided to stop sending dues and to no longer attend any future meetings. It doesn’t take a rocket scientist to figure out that, if SWPA pulls out, the SLC is dead in the water. 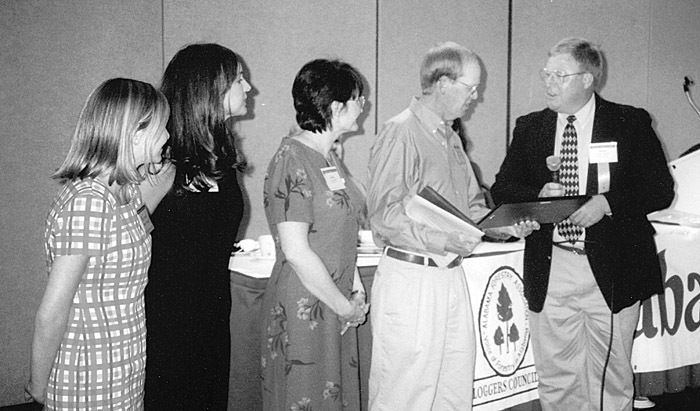 Remember, Arkansas Timber Producers Assn. already doesn’t participate in the regional organization. Earlier this spring, the North Carolina Forestry Assn. (NCFA)—in conjunction with the North Carolina Dept. 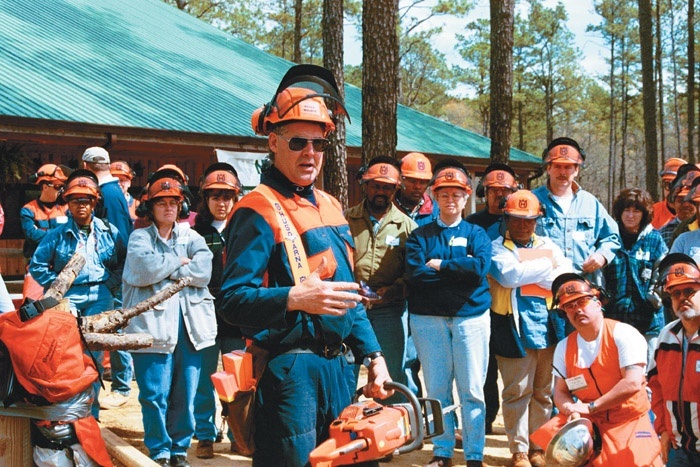 of Labor (DOL)—held its Sixth Annual Saw Safety Joint Training sessions at Johnston Community College’s Howell Woods Resource Center at Smithfield. 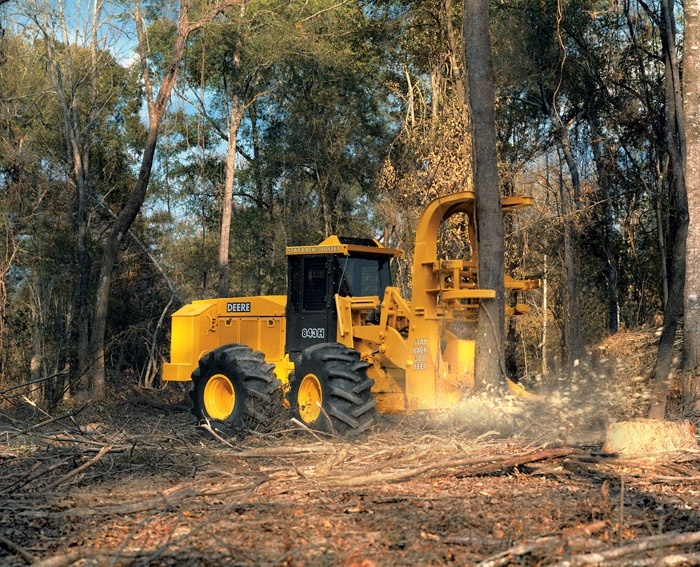 Each year the logging industry inches its way to more mechanization. Yet, no matter how technology changes the face of a logging operation, the basic element of any job will always be a chain saw. More than 200 loggers, spouses and other guests attended Alabama Loggers Council’s annual meeting in Montgomery on April 29. Guest speakers included Wood Supply Research Institute participants Joe Sanders (University of Georgia) and Don Deckard (Louisiana Tech), and American Forest & Paper Assn.’s Brad Williams, who updated the group on the Sustainable Forestry Initiative. Pioneer Machinery, a large forestry, construction and industrial heavy equipment dealer in the Southeast, recently agreed to represent the medium and heavy lines of New Holland Construction. 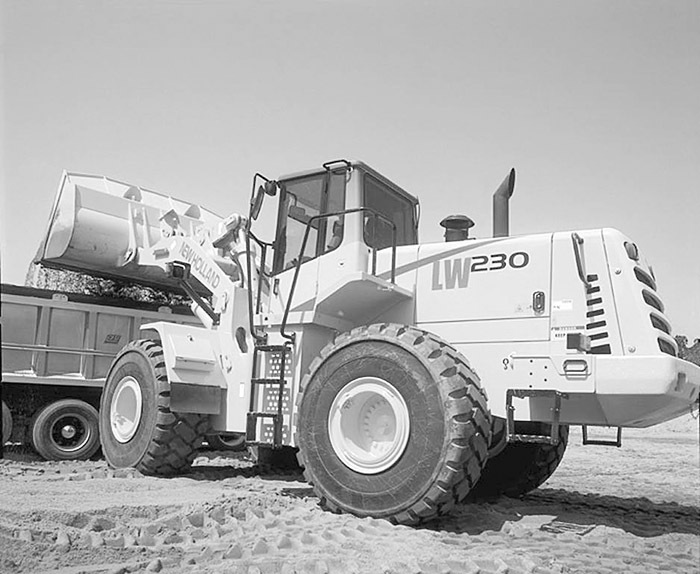 New Holland, a division of CNH Global, is now the world’s third largest construction equipment manufacturer following the merger of New Holland and Case Corp. earlier this year. John Deere introduces the H series feller-bunchers, designed to be more maneuverable, stronger and more productive. The list of improvements include a new tapered roller bearing center joint. Limb risers are eliminated while hood is stronger and more streamlined. Fuel and hydraulic tanks have been “beefed up” and a wrap-around rear bumper is standard. Park brake is enclosed and oil-immersed and the driveline is lubed for life. Double Trouble From Mountain Pine Beetles?